Now it’s time to start making folders and filing them. This process should be pretty obvious so I’m not going to go into great detail. DO use a label maker to mark the tabs if at all possible. 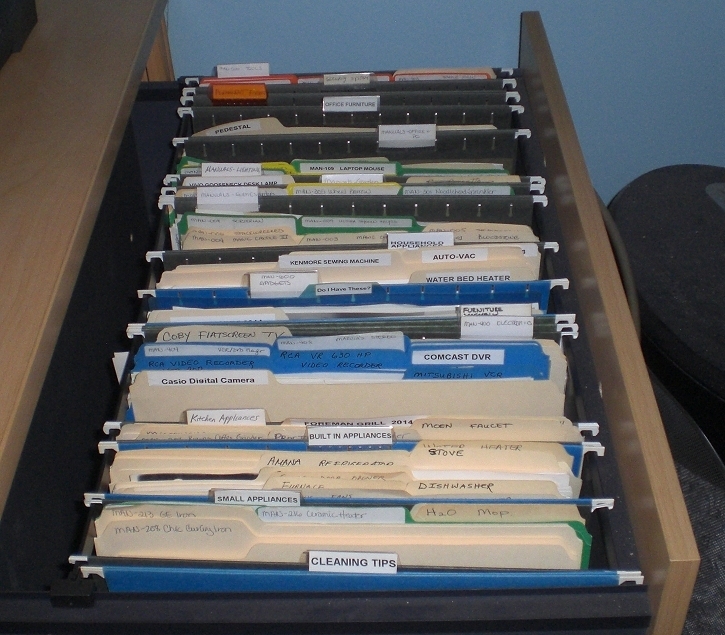 Your hanging category files are already in place, so it’s a breeze to file your manila folders. But do not file ANY monthly financial material from the current year (or anything else you save annually). My Financial hanging file has just two folders: Pension and Social Security, and these are for documentation, not monthly statements. If all your paperwork is monthly statements, you may not even need a Financial file. 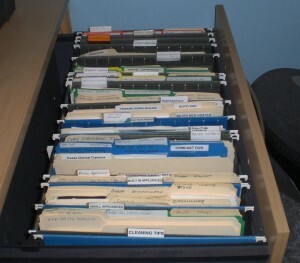 After you’ve finished labeling and filling each folder, file it in the appropriate hanging file. I wish I had kept my health records separate for each year. They’re all mixed together and I just don’t have the oomph needed to correct that. I also didn’t save all the medical history info that I should have. Doctors always want to know what year I had this or that surgery, and I didn’t keep records of those. I wish I had long ago kept my “Memories” folders by year (or two or three years’ worth – however long it took to get them full but not bulging). There’s no way to go back and change this – almost none of the material is dated. You probably have other sorted papers that don’t fit into any of the existing categories, so now is the time to make new hanging files and file folders for them. All monthly bank and credit card statements for the current year (if you save paper copies). All tax paperwork for last year (if you have not filed your taxes yet) and the current year. All paid medical bills and medical history(ies) for the current year. All utility bills for at least the current year (if you save paper copies). Unpaid property tax statements (if any). Any other paperwork for the current year you want to save. This could include Memories, Pet Records, School Records, etc. – anything you want to store by year later on. All of the above should already be clipped together by type and labeled with sticky notes. Don’t touch this material yet. If you have material to save (like tax returns) that is more than 3 years old (not counting the current year), put it in labeled file folders, by year, for permanent archiving (Step 10). For example, it’s now 2015. This means anything older than 2012. Set aside for now. “Built-In Appliances” includes the refrigerator, dishwasher, stove, furnace, air conditioner, range hood, water heater and garage door opener. “Kitchen Appliances” includes the toaster, blender, Foreman grill, knife sharpener, etc. *“Small Appliances” – I should get rid of this. Everything in it belongs in “Household Appliances” – the vacuum cleaner, Spot Bot, H2O Mop, iron, etc. are divided between these two folders. I’ll fix that – soon (soon being in the next year or three). “Permanent Fixtures” contains things like the electronic door locks, thermostat and ceiling fans. Almost every item has its own folder within the hanging file. If you don’t do this, you’ll have a lot more difficulty finding the manual you want when you need it. Where I got lazy is Gadgets – these are just tossed in loose. Bad choice. I’ll fix that – some day (see the definition of “soon” above). I remind you again how grateful I was that the prior owner had kept all the manuals for the appliances in this house (plus the other information I mentioned). If you don’t own a home yet, keep this in mind for the future. Also remember that if you donate an item with a manual, give it away, sell it, etc., you’ll want to include that manual!